Indeed it is now boarded up and the site destined to be part of platform 22 at the new enlarged Euston. 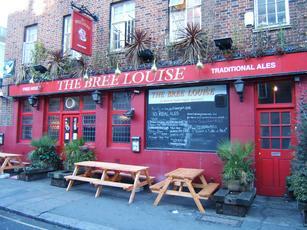 Last chance to visit the Bree Louise – the Euston pub closes this weekend. Feels like a genuine local although service can be a bit hit or miss depending on who serves you. A massive range of beers many of which are of the less common variety. Experience has found the beers from the pump are fine whereas the ales from the barrels behind the bar are more hit and miss. More down to earth than some of the other nearby pubs sadly its future is in doubt due to the creation of the HS2 route. Little point in writing a review of this, my last visit. Come November 2017, it will be the first notable victim of HS2. Used to be my regular stopping off point before travelling home until I found the Doric Arch. A real beer house - with half a dozen on pump and another dozen on gravity fed behind the bar. Not a fan of the gravity fed system, so I always went for a pump. It was the place I discovered Titantic Plum Porter. Now that the Cider Tap has closed, this is the best place in the Euston area for cider. For beer, the Euston Tap is probably preferable with beer quality better. But the range of ales here is impressive. On a visit yesterday, they had Banks's Sunbeam, Art Brew Unfined Orange IPA, Milestone Magna Carta, Southwark Harvard American Pale Ale, Downton Roman Imperial Stout, Brains The Rev James Bitter & Gold, Dorset Brewing Company Tom Brown's Bitter & Chesil, XT Pi Mild & Xperimental CF 127, Nottingham Mild, Dorking Black Noise Porter, Dark Star Hophead, Bree Louise Session Pale Ale, Titanic Plum Porter, Windsor & Eton Kohinoor IPA & Knight Of The Garter, Stod Fold Blonde & Portobello Spring Ale & Westway Pale Ale. I was back today and a few different ales had appeared - Wimbledon Quartermaine IPA, Downton Four-Leaf Porter, Wychwood Hobgoblin & Rebellion Zebedee. 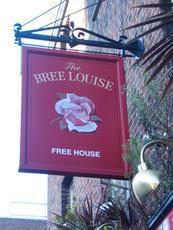 Ciders on both visits were Millwhites Apples & Pears, Rum Cask & Bree Louise House Cider, Harry's No. 8, Kentish Pip Craftsman, Sandford Orchards Pear Shaped, Farmer Jim's Farmyard Fruits, Blaengawney Hallet's Perry, Scoundrel Dry Scrumpy & Westons Old Rosie. I still find the pub itself pretty unwelcoming and staff are far from friendly. 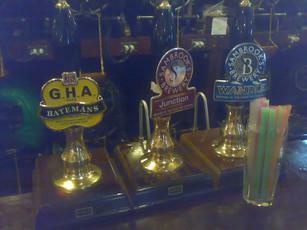 But it's still a great choice for a decent ale/cider selection in the Euston area.